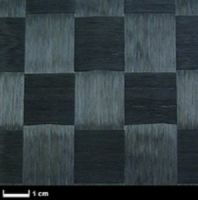 TeXtreme® Carbon fabric 80 g/m² (plain, HT) 2 mq. TeXtreme® Spread Tow Fabric (STF) increases the performance and reduces the weight of your composites as well as enhancing the surface finish making the composites aesthetically appealing. The material is pliable and easy to handle when forming and cutting. TeXtreme® is available in a variety of areal weight and fiber type configurations. The specified tissue weight increases by the binder to about 9 g/m³ . Due to the manufacturing process sporadical "weaving defects" can occur, mostly consisting of warp joints. These are labelled with coloured tape on the fabric itself as well as on its edge. It´s possible to remove this labelling with the use of heat (heat gun) without leaving any residue. We do guarantee a free of defects roll up to 3 m length.